Believe it or not summer seems to be winding down here in Cincinnati. After a good three months of incredibly, unbearably hot days the mornings finally have a chill to them. I take all of this as a very good sign. Summer can pack its bags and leave. Autumn is the best season, and has the best beers (some of which have already hit the market and have taken refuge in my fridge, where I've picked them off one by one). In all my rush to enjoy fall and its brews to the fullest, I let something fall behind. Luckily I realized it a few weeks ago and plan to correct my mistake today. With this post, I'm discussing my absolute favorite summer seasonal: Woodchuck's Summer Time. 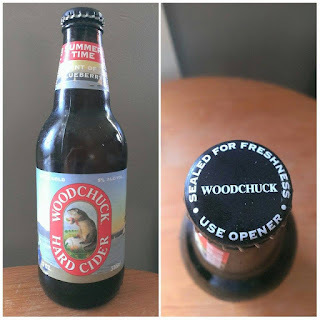 I've talked about Woodchuck before so I'll refer you to my previous posts on their ciders if you'd like more information. If you don't feel like clicking those links, here's the rundown: the Vermont cidery was founded in 1991 and jumpstarted the current US cider craze. As always, the official website has more information. Woodchuck's website does not, however, give much information on Summer Time. It just says it's cider "...topped off with a touch of blueberry juice." It's a good thing the label so clearly states it has an ABV of 5% or else I probably would've never known. 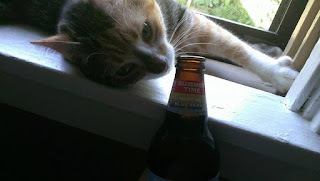 The cider's aroma is sweet, which may be why Purrl only gave it three whiffs. 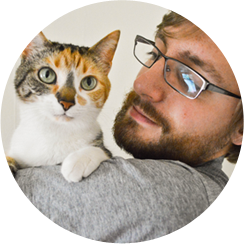 After all, cats can't taste sweet things. Why would they like the smell of them? For my part I love the aroma. I can suss out both the apple and the blueberry. Very nicely done, Woodchuck. I would be so bold as to say that there's more than a hint of blueberry in Summer Time. To me, the cider tastes pretty much half apple and half blueberry. Believe it or not, it's an excellent combination. Contrary to the aroma, the cider is much more bitter than it is sweet. It's still refreshing all the same. There's a light fizz to the cider. It's not as smooth as a lager but not bubbly like a wine cooler. While flavorful, it's not as thick as a stout; it's more akin to a pilsner. Or hard cider. It's something of a tradition for me to finish my summer with a playthrough of The Legend of Zelda: Link's Awakening. This became the case one summer, some years ago, when I was running through a park and strayed from my normal path. The new way I took through the woods made me feel like an adventurer. Which, in turn, made me recall my first time playing through Link's Awakening. The decidedly summerness of Summer Time just makes me think of that Inception-style memory-within-a-memory. Summer thoughts for a summer cider. I can say, without hyperbole, that Woodchuck's Summer Time is my quintessential adult beverage. It's oozes the feeling that is only perfectly captured on warm, sunny days. Whether kicking back and relaxing on a day off of work, or unwinding after a tiring day, there's no better brew to reach for in the summer than this. Summer Time takes home a well-earned 9.5/10 from me. Purchase on sight.